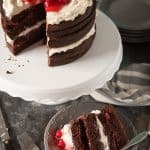 This Black Forest Cake is a glorious combination of chocolate devil’s food cake layered with sweet cherry filling and light ermine buttercream frosting in this modified version of a German original. Last week was my birthday. But in our house, we feel like one day a year just isn’t enough so we celebrate birthday week, and even jokingly celebrate birthday month. Which explains a lot about why October is my favorite month of the year. It’s not as big a deal as it sounds – the birthday girl (or guy) basically just gets to lord it over everybody else that it is their birthday month and call in special treatment all month long (within reason – it’s no fun if you take it too far and act like a complete brat about it). Mostly it’s things like invoking foot massage rights or stating that you will not be doing the dishes even if it’s your turn because “it’s birthday month.” Which usually elicits a good-natured groan and a night off from dish duty for the birthday person. But since it was my actual birthday, that meant I got to make my favorite cake that I make for myself every year on my birthday – a Black Forest Cake. Even though my normal dessert choice is a pie like this Homemade Blackberry Pie or a Salted Caramel Apple Pie, when it comes to my birthday I go traditional and have to do cake, particularly a Black Forest cake. It’s tall and beautiful and different and there is just something about cherries and chocolate that makes me so happy! Black Forest Cake has been “my” birthday cake since I was probably about eight years old, which is around the time I first discovered it. 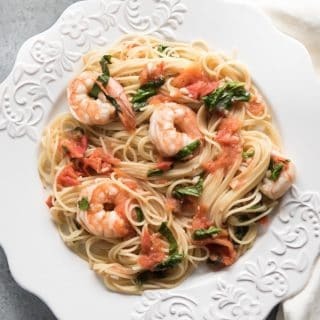 The credit for this recipe goes to my mom’s oldest sister – my aunt Becky – who passed away when I was a senior in high school. This recipe is especially precious to me because she used to make it and I remember asking her to share her recipe with me. Every time I make this I am reminded of her and how she loved me and how much I love her. It’s like a little memory of love that is a birthday gift all it’s own every year even though she has been gone from us for a long time. 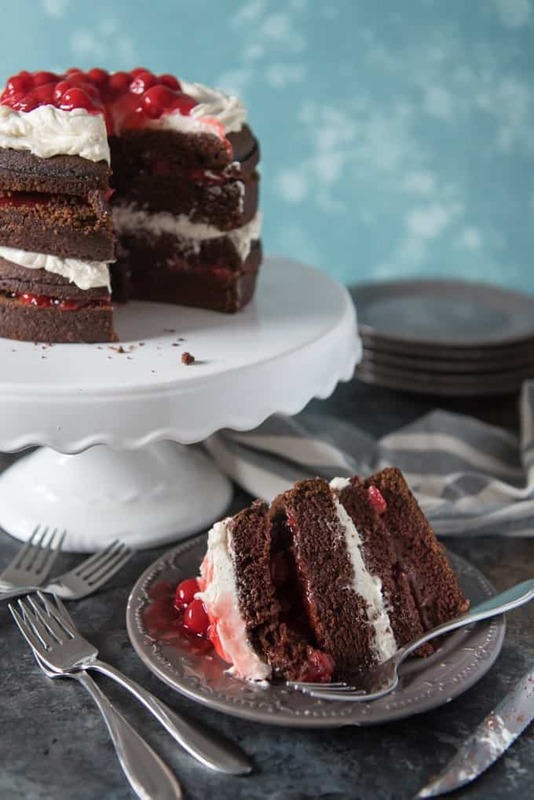 I’ve tweaked the recipe a little over the years, but by and large this is still my Aunt Becky’s Black Forest Cake. Now, I’m going to come right out and admit that this is not a super authentic Black Forest Cake, which originated in Germany and is called Schwarzwälder Kirschtorte. Paul and I lived in Frankfurt for a summer during law school and while we were there, I sampled lots of Schwarzwälder Kirschtorte. And my version just isn’t the same as those slices I sampled, wonderful though they may have been. There are lots of similarities, for sure, but true Schwarzwälder Kirschtorte typically has layers of whipped cream, maraschino cherries, chocolate shavings, and chocolate sponge cake brushed with kirschwasser, which is a sour cherry liqueur. Wikipedia says that there is even a German law mandating the presence of kirschwasser for a cake to be labeled Schwarzwälder Kirschtorte, which I find fascinating both as someone who loves Black Forest Cake and as a former lawyer. 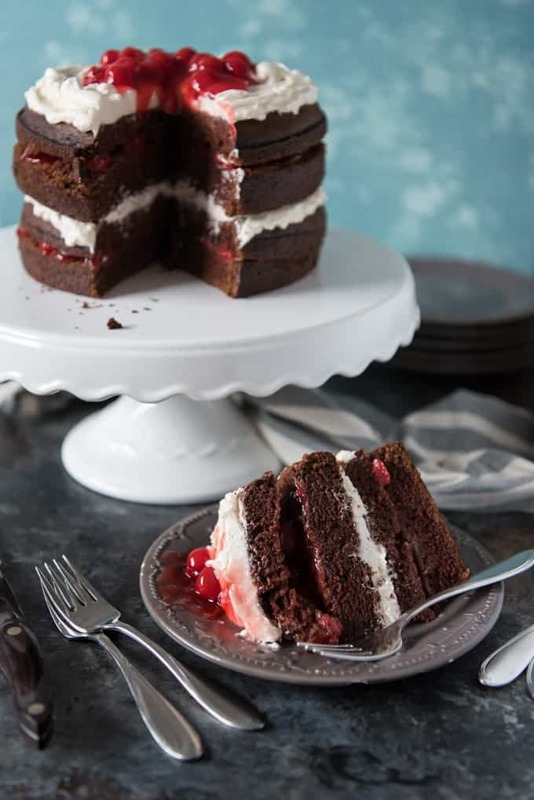 Aunt Becky’s version of a Black Forest cake uses chocolate Devil’s food cake instead of a chocolate sponge cake. It also uses cherry pie filling instead of maraschino cherries & kirschwasser. And the whipped cream is replaced with an Ermine buttercream (aka French-style roux icing, flour buttercream, or boiled milk icing – after 20+ years of just following the recipe that didn’t name what kind of crazy frosting called for flour and granulated sugar, I finally googled it and found all these different names for this old-fashioned frosting that is light like whipped cream but with a bit more oomph). And you know what? It tastes amazing. Honestly, and I say this with some chagrin and a slight cringe, I like this version better than the “real” thing. 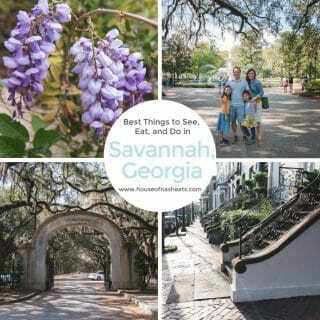 I hope I don’t get nasty comments for admitting that on a food blog! 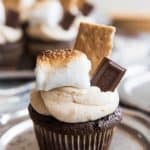 Now, if you read the description above and were wondering what Ermine buttercream is (and possibly being put-off by an alternate name like “boiled milk icing”), allow me to elaborate. 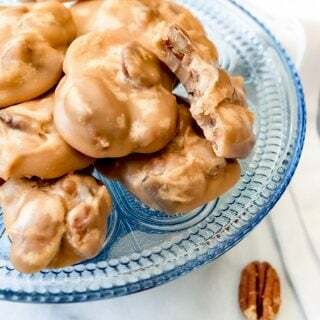 It’s a frosting that is made from a roux (a little like a paste) of cooked flour and milk, that is then cooled and combined with butter and granulated sugar (not powdered sugar) and beaten until super light and fluffy. It might sound bizarre to make frosting with flour and granulated sugar, but it is really, really wonderful! It’s significantly less sweet than a traditional buttercream made with powdered sugar, but it is also super creamy and soft. 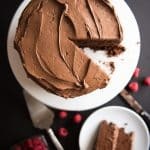 You can use it on any cake or cupcakes, though it goes particularly well with chocolate or red velvet cake. 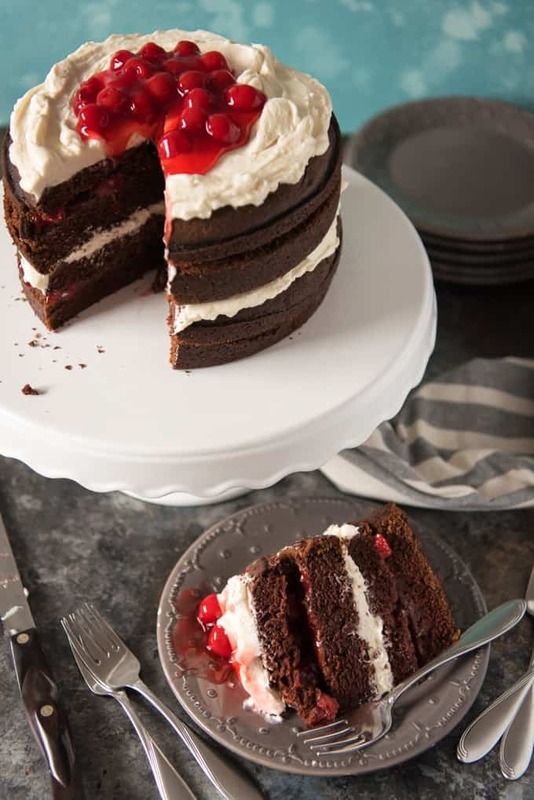 I like it for Black Forest cake because it lets the sweetness of the cherries and the richness of the chocolate cake shine without overpowering them like so many cloyingly sweet buttercream frostings might do. I also don’t bother frosting the sides of this cake. The traditional version covers the sides with whipped cream and chocolate shavings, but (1) chocolate shavings just aren’t worth the hassle for me, (2) I like the look of a naked cake where I can see the alternating layers of frosting and cherry filling, and (3) I don’t remember Aunt Becky frosting the sides of her Black Forest Cake either. When possible, I like to make this cake a day in advance because I always think it is better the second day once the cherry filling has had a chance to really soak into the chocolate cake, similar to how the kirschwasser is used to moisten and flavor the chocolate sponge of the Schwarzwälder Kirschtorte. You could maybe get away with only one can of cherry pie filling, but I always use two because I love, love, love the extra cherries and having plenty to pile on top. I hope you love my Aunt Becky’s Black Forest Cake as much as I do. Do you have a go-to birthday cake that you make each year? I would love to hear about it in the comments below! 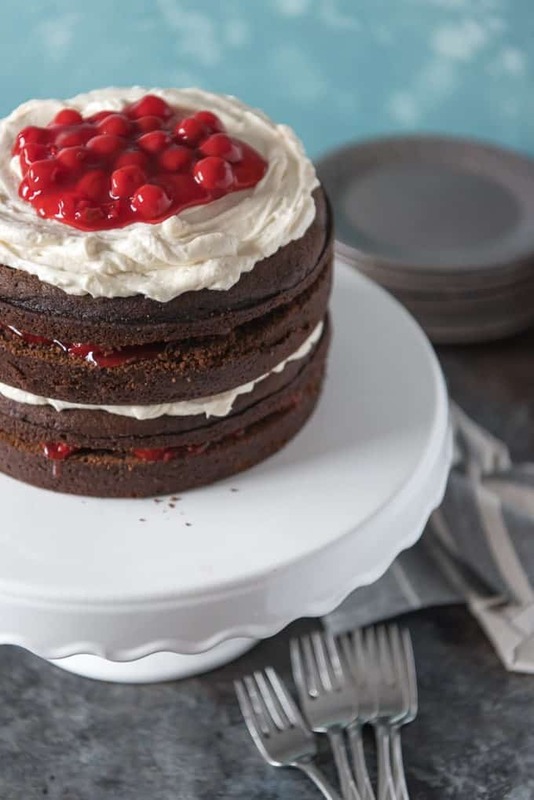 This Black Forest Cake is a glorious combination of chocolate devil's food cake layered with sweet cherry filling and light ermine buttercream frosting in this modified version of a German original. Preheat oven to 350 degrees. Spray two 8"-inch round cake pans with cooking spray and line the bottoms with parchment paper. Set aside. In the bowl of a stand mixer, cream together the butter and sugar until light and fluffy. Add eggs one at a time, beating well after each addition. Sift the flour, cocoa, baking soda, and salt together and add alternately with the buttermilk and vanilla, beating well after each addition. Add the boiling water and mix well, scraping the sides of the bowl as needed, then pour into the prepared cake pans and bake for 30 minutes at 350 degrees or until a toothpick inserted into the center of the cake comes out clean. 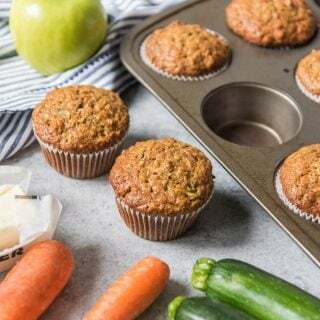 Remove from pans and cool completely on baking racks. 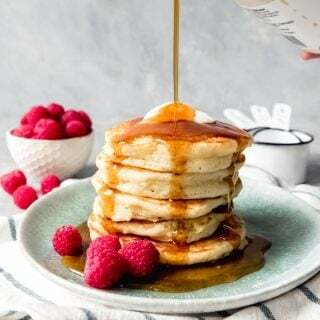 In a medium saucepan, whisk together the flour, salt and milk over medium-high heat and cook until it thickens to form a roux or thick sort of pudding almost, then remove from heat and allow to cool completely, stirring while it cools. Once the roux is completely cool, cream the butter and sugar together in a separate bowl for 2-4 minutes, until light and fluffy, then add the vanilla. Then, while beating, add in the cooled flour/milk mixture and beat well until the frosting is smooth and creamy. 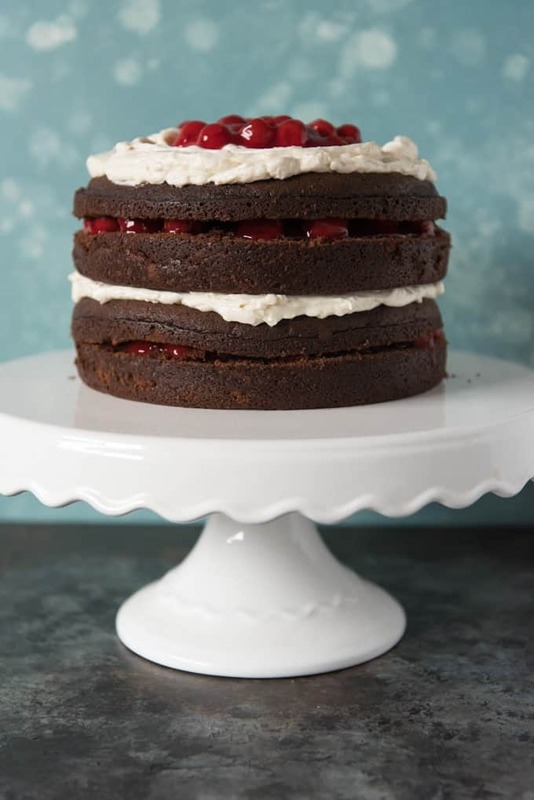 To assemble the Black Forest cake, first level off any dome so that each layer of the cake is nice and flat, then slice each cake horizontally into two layers so that there are four evenly sized cake rounds. Set the first cake layer on a serving plate or cake stand, then cover with 1/3 of the cherry pie filling. Gently lay the next cake round on top of the cherries and spread with about 1/2 of the ermine buttercream to create a nice layer of frosting (I don't always use the entire batch of frosting so it might be a little less than half). Add the third layer of cake on top of the buttercream and top it with 1/3 of the remaining cherries. Add the fourth cake layer and cover it with the remaining frosting, then top with remaining cherry pie filling in the center without going all the way to the edges of the cake. Do not frost sides of cake. Let the cake sit for 8-12 hours or more for the chocolate cake layers to absorb some of the cherry filling, then slice and serve. Stunning pictures, I’m sure this cake is a real hit. I pinned and save it for later btw. 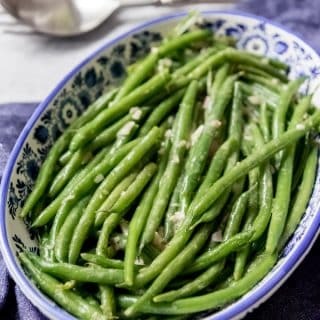 How do I pinn a recipe from House of Nash Eats.com.? I’ve loved some of your recipes but it’s a job coping them down by hand. I’d really like pinning and saving them. Is that possible to do? Absolutely, Marilyn! I’m so glad you asked! There are a couple of ways – at the top and bottom of each post are little square buttons – one of them is red with a “P” on it and if you click on that it should link to your pinterest account and allow you to pin right from there. The other way is if you hover over any image on the post, a little red “pin it” box will appear just above the upper left-hand corner of that photo. If you click on that, again, you should be able to pin right from the site! You could also follow my blog’s pinterest page where I include pin links to each of my posts and you can easily re-pin from there. 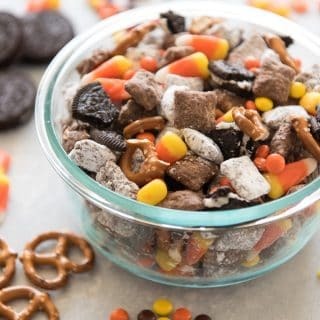 That is at https://www.pinterest.com/houseofnasheats/house-of-nash-eats-recipes/. So glad you are enjoying the things I have been posting! Thank you so much for the quick reply and the information . I am looking forward to making the Black Forest cake for my son and daughter-in-law’s anniversary. She will love it! Looking forward to many more of your good recipes. Thank you again. I love your Aunt Becky and I’d like to adopt her! This looks amazing! Thank you, Lisa! I love her too! Happy Birthday! 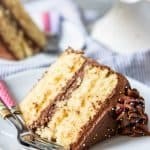 This cake is BEAUTIFUL – as is everything else you post. I don’t think I realized that Black Forest Cake was cherry based. I’m not a chocolate person so I’ve never tried a piece, but I do love cherries (and especially cherry pie – so I think I’d definitely prefer your ‘inauthentic’ version!). You know, I’m not a chocolate person either!! Not that I don’t like it, really, but I always want it with other flavors like fruit or nuts! 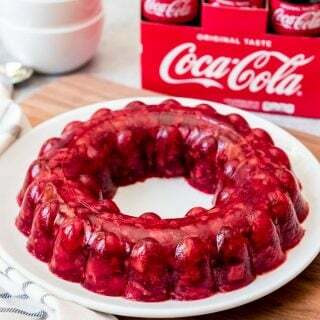 I think that’s why I love this very cherry filled cake so much! What a gorgeous cake for a celebration! It is my mums favourite so we always bought one for her birthday when I was little – may just have to make her one next time! Holy moly I love black forest cake! Looks so rich and decadent. And love all those layers!! Do you use 8″ or 9″ cake pans? About to make! Can’t wait to try! I use 8″ cake pans, Dayla! Thanks for the comment – I should make a note of this in the recipe! This cake looks amazing. I used it as inspiration, and made the Ermine Buttercream. I had blueberry pie filling to use up and made a white cake to go with it. Exactly like yours….. *snort* Sorry, but I did use your buttercream recipe. It was so simple, and tasted good. Lol – I love it! So creative of you! I think the blueberry vanilla cake with ermine buttercream sounds wonderful! Hey there! I made this cake once before and loved it! Before I didn’t have much time to let it sit so I served it the same day, but this time I am serving it the next day. Should I chill it in the fridge or leave it out on the counter over night? I have always left mine out overnight, but it would be fine in the fridge.